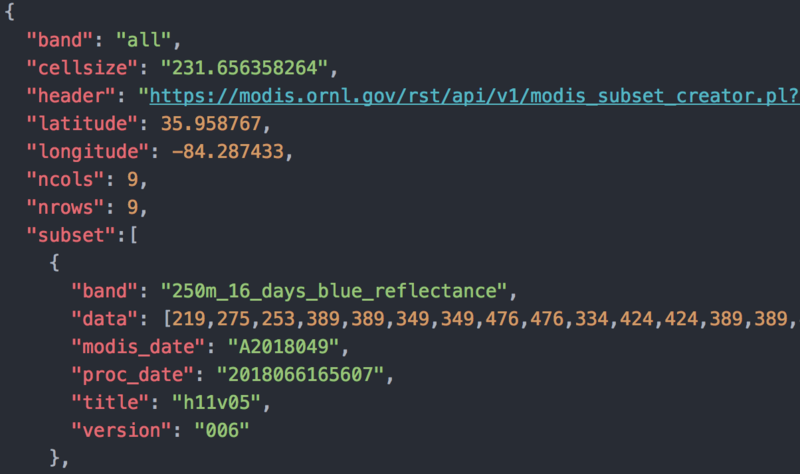 The Open API documentation page for the web service can be accessed from https://modis.ornl.gov/rst/ui/. Example clients are provided on the MODIS/VIIRS Web Service page. Please refer to: https://modis.ornl.gov/data/modis_webservice.html. Please refer to Section 5 of this document and to the MODIS/VIIRS Citation Policy page for more information on how to cite data obtained through the web service. Figure 1. Users may access data through the web service for any land location on earth. The MODIS/VIIRS Web Service provides data access capabilities for several MODIS Collection 6 and VIIRS (Version 001) land products. The web service provides data access functions for users to execute on their local computing resources. The web service is built upon the ORNL DAAC's MODIS/VIIRS Global Subsetting and Visualization Tool that provides customized subsets and visualization of land products for any land location on earth. With the web service users can retrieve land product subsets through command line operations (using wget and curl commands); download subsets directly into applications such as Python, R, Perl, Matlab, and others and integrate the subsets into client side workflows; download subsets and write custom code to use the subsets in a visualization; and download subsets and write custom code for data reformatting. The data products available through the MODIS/VIIRS Fixed Sites Subsetting Tool are generated by instruments on three satellite platforms: the MODIS instruments flown on NASA's Terra and Aqua satellites, and the VIIRS instrument flown on Suomi NPP. MODIS products from Terra are available from February 2000 to present and Aqua products are available from June 2002 to present. VIIRS products are available from January 2012 onward. They are available for daily, 4-day, 8-day, 16-day, and annual composite periods at 250-m, 500-m, or 1-km resolution, depending on the product. Data in spatial file formats are available in sinusoidal and geographic (WGS84) projections. Please refer to the MODIS/VIIRS Documentation page for a list of available Collection 6 land products. The MODIS/VIIRS web service streamlines the use of MODIS and VIIRS land product data for characterization of field sites, validation of models and other remote sensing products, and other research activities. MODIS and VIIRS tiles are provided to the ORNL DAAC by the Land Processes DAAC (LP DAAC). The ORNL DAAC creates subsets and packages the data for research applications. The MODIS/VIIRS Web Service provides data access capabilities for Moderate Resolution Imaging Spectroradiometer (MODIS) Collection 6 and VIIRS land products. The web service provides data access functions for users to execute on their local computing resources. Available resource URIs are described in more detail here. With the web service users can retrieve land product subsets through command line operations (using wget and curl commands); download and integrate subsets directly into client side workflows; download and visualize subsets with customized code; and download subsets and write custom code for data reformatting. Version 2.1, released on 2018-08-10, offers several VIIRS land products. Version 2.0, released on 2018-05-21, uses Representational state transfer (REST)-ful API and offers improved performance, simpler client solutions and standard-based specifications. This new web service replaces the previous Web Service, which used a Simple Object Access Protocol (SOAP)-based technology.